Nothing Happens All the Time: Homicides Truly Know How to Interrupt a Good Meal! The setting of the book is based in the future sixty years in the year 2076. Most of the characters work in the detective bureau in Boston PD, with other characters outside of the division added in to provide the variety of life necessary to keep things interesting. Given the storyline is in the future, naturally there are going to be elements of possible future tech involved. A good mystery, whodunit, detective novel with glimmers of romance and science fiction wrapped around by a causational flow of energy to help keep the story moving from start to finish. Detective Eli Mitchell enjoyed working the cases that landed on his desk, regardless of who they involved and the implications of the crimes tying them to the investigation. He loved his job and the Boston metropolis certainly had its fair share of incidents to keep the job interesting, outside of the so-called daily routine stigma that's been the cause of career burnout in far too many good officers. An occupational hazard that came with the job whether it was recognized as such or not. How could Detective Mitchell possibly know that his next big case, a homicide at one of the local convenience stores, was going to set events in motion over the next twelve days that would completely change every aspect of his life? Events that would soon turn his world upside down and inside out beyond the limits of the surreal, regardless of any departmental training, on the job or life experience, and even his own understanding of being. It's a damn good thing for him that he has coffee. Book One of The Perpetual Manifested States of Being series. Originally from the New England area, my family moved us across the country during my youth. Currently in Utah, I’ve always found writing to be a good outlet for the various thoughts and ideas that inspired me to write over the years albeit more so as a philosophical hobby than anything serious, until now. Outside of my ongoing career in law enforcement, I enjoy spending time with my wife and children when I can't find the time to do some fishing, camping, or the occasional computer game or two. Reviewed By Christian Sia for Readers' Favorite - Review Rating: 5 Stars! Nothing Happens All the Time: Homicides Truly Know How to Interrupt a Good Meal! by Edmund Mahon is a masterful blend of detective fiction and thriller set in a time that isn't here yet. Life is normal for Eli Mitchell with his innumerable cups of coffee and regular cases to solve, but when a homicide takes place at a convenience store nearby, the astute detective finds himself plunged into a whirlwind of events that will try his spirit and force him to deal with more stress than he'd ever experienced before. He has to brace himself for challenges that can make or break him and, even with the support of the Boston PD, will he be able to solve this case before it's too late? 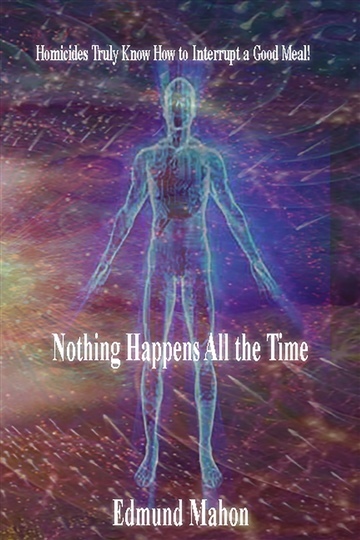 Nothing Happens All the Time is a title that ironically describes a novel packed with intense action. The author creates an interesting story, set sixty years in the future, but with great skill and imagination he creates characters that seem so real and normal. There is a mix of literary elements that make the story most enjoyable - the biting suspense, the powerful and engaging characters, the beautiful prose, and a lovely setting that will entice readers as they turn the pages. Most readers will love the sense of humor in this book. Edmund Mahon has created a very beautiful character in Mitchell, one of those characters readers will want to stick with throughout the book. The story is well fleshed out and the author's voice comes across as unique and powerful. This book will entertain readers and keep them turning the pages, eager to know what happens to the case and their beloved characters. Reviewed By Divine Zape for Readers' Favorite - Review Rating: 5 Stars! I expected something else when I picked up Nothing Happens All the Time: Homicides Truly Know How to Interrupt a Good Meal! by Edmund Mahon. The title of this interesting and fast-paced thriller can easily mislead readers to anticipate a character waiting for something very important to happen and yet nothing is happening. On the contrary, this multi-genre, exceptional novel is laced with a lot of action. Eli Mitchell is heading an investigation of a homicide that took place in a Boston convenience store, and the events triggered by this crime become more and more complicated to handle as they are incomprehensible. There is a lot at stake and unspeakable damage could be done if the case isn't resolved on time. The author, Edmund Mahon, makes his story more gripping by employing a series of techniques that will keep readers guessing all the time. Readers want to know who committed the crime and when they think they have guessed right, they immediately realize they have been tricked and they keep reading on. I loved the clear and crisp writing, the acute suspense, and the variety of themes that are masterfully developed in this novel. This is a book from a new and interesting voice that I will gladly recommend to fans of sci-fi, crime fiction, thrillers, and fantasy. Nothing Happens All the Time: Homicides Truly Know How to Interrupt a Good Meal! will be a wonderful thrill to many readers, a real page-turner. It is a book that will find a very comfortable home amidst the likes of James Patterson.